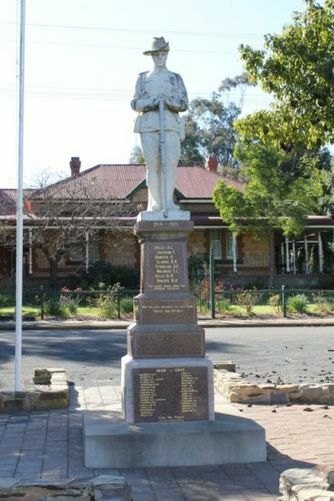 Tarlee War Memorial commemorates those from the district who served in World War One and World War Two. The memorial was originally erected to commemorate the fallen and returned of World War One with the names of those who served in World War Two added to the memorial at a later date. The Memorial is a white marble statue of a World War One soldier with arms reversed on a polished red granite column. There were conflicting views on the form that the memorial should take. Many of the young people of the district were very much in favour of establishing a new sports ground - with the entrance gates a war memorial. Others deemed that a statue placed in the centre of the town would be a more fitting tribute. At the first meeting it was decided that land should be sought for a sports ground, but as no farmer could be persuaded to sell, the statue was erected. In the presence of the public from all parts of this district, the Chief Secretary (Hon. J Jelly), unveiled a beautiful memorial on Saturday afternoon last, May 2. The Riverton District Boy Scouts, under Rev. A. Webb, formed a guard of honour. The local school children under their headmaster, Mr. W. J. Dawson, flanked the monument. The Chief Secretary thanked the president and the public for asking him to unveil the Soldiers' Memorial, in the unavoidable absence of the Premier (Hon. J. Gunn) who it was announced, would be present. In his remarks he spoke of the unity of the Empire, the quickly answered call of the Motherland, the willingness and self sacrifice of the Australian soldiers, the justly proud results of our Australian volunteers, the patient mourners of the fallen heroes, and appealed for strongest sympathy and practicable help toward the returned men and the incapacitated soldiers generally. Kapunda Herald (SA), 8 May 1925. THE ABOVE BRAVE MADE THE SUPREME SACRIFICE. MEN WHO HAVE ANSWERED THE CALL FROM TARLEE, AND DISTRICT.